'Dream Keeper' OGB (Vernon & Dana Brown, R. 2005). Seedling 98-107-1. AB, 28" (71 cm). Midseason bloom. Standards ivory white, flushed yellow on the midrib; style arms, cream flushed yellow; Falls ivory blushed light cinnamon lightening to white at the edges; signal red-black at the end of yellow-orange beards. 'Lancer' X 'English Eyes'. 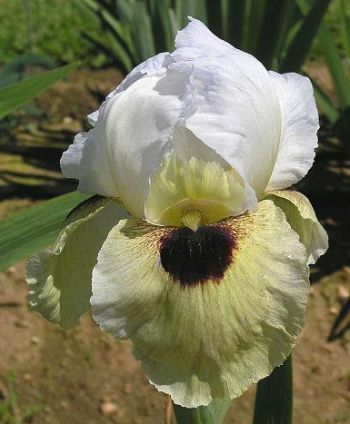 Malevil Iris Gardens, 2005.